The headband and the ear piece's are both well padded, so you can wear them for a couple of hours at a time. They also do a good job of blocking out any background noise, so you can just focus on my music and my work. And these headphones are quite stylish, you have several fun color combinations to fit your preference. 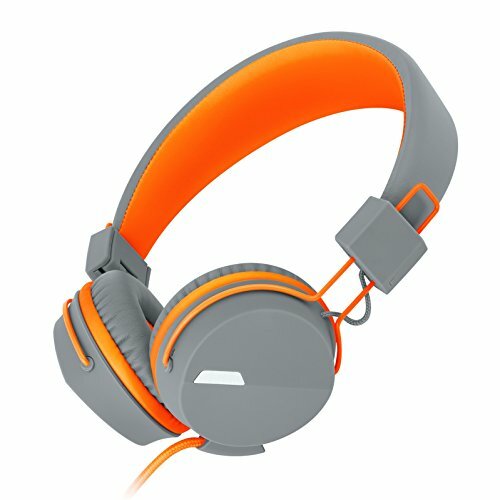 These headphones easy to wear and adjustable to fit your head. They have enough pressure to stay on your head, but don't put too much pressure on sensitive parts of your ears. Never using a headphone for too long, it will hurt your hearing. 1.One click: Play or pause music; Double click: Next song; Triple click: Last song. 2. One click: Answer or end the phone calling. Great stereo headphones with in-line mic, you can hear HD sound and answer your phone call with clear voice. Folding and rotating design, adjustable ear and stretching bracket, it's easy to carry and save your spaces. Soft ear-pad material and noise reduction technology make it comfortable for wearing and perfect for listening. 1.5 meter nylon rope cord and 3.5mm L shape jack, compatible with iPhone 6/6S Samsung /Sony /Nokia /HTC etc. Under 5 months guarantee. If these headsets have any problem, you can contact our Customer Service Team. If you have any questions about this product by KANEN, contact us by completing and submitting the form below. If you are looking for a specif part number, please include it with your message.